Six months after release, ArtRage for Android is still one of the highest rated major painting and drawing apps on the Google Play Store. Nearly two years after release, ArtRage for Android is the top paid app in the Arts & Design category. Update 1st February, 2015: ArtRage for Android was released on the Google Play Store. ArtRage for Android is optimized for Samsung Galaxy Note 4 and has been selected for GALAXY Gift as a free download. In Auckland, New Zealand, October 17, 2014 — Ambient Design (www.artrage.com), the award-winning creator of realistic art software, announced today that it is launching ArtRage for Android, optimized for the Samsung Galaxy Note 4. Samsung has selected ArtRage for availability in a number of global markets for GALAXY Gift. This will provide Note 4 and Note Edge users the exclusive ability to download the software for free. ArtRage for Android will launch at the same time on the Samsung GALAXY Apps for purchase by users of selected Samsung Galaxy mobile products. 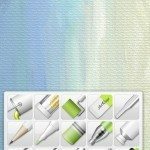 ArtRage provides detailed paint blending and texture, using a simulation of natural artistic tools that work seamlessly with the advanced features of the Samsung Galaxy Note 4’s S Pen to enable users to create realistic artwork on-the-go. Artists can use ArtRage on the Samsung Galaxy mobile platform to share their artwork via popular artist communities and social media sites, like PEN.UP, deviantArt, Facebook, Twitter, and Flickr, as well as send art by email or save to Dropbox. For a limited time ArtRage for Android will be available exclusively from Samsung GALAXY Apps, free for Galaxy Note 4 and Note Edge users through Samsung GALAXY Gifts. For other Samsung Galaxy mobile device users, it will also be available at US$4.99. Check GALAXY Apps in your region for details. ArtRage support for additional Android devices is planned for early 2015. High quality rendered strokes show the amount of paint on the canvas, letting you play with texture as well as color. Oil Brush with paint thickness and smearing. Watercolor with fluid dynamics to simulate stroke blending and spreading. Airbrush with soft color spray. Palette Knife for spreading and blending pigment. Paint Roller & Tube for laying down thick coats of paint. Inking Pen with auto-smoothing and pressure simulation. Pencil & Marker Pen, Chalk & Crayon and Eraser for drawing and sketching. Settings for fine control of each tool and custom tool presets for storing favorites. Unlimited layers with available memory. Easy to save incremental copies. Blend Modes, including Photoshop standards. 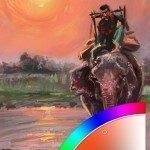 Reference & Tracing Images to help you as you paint. 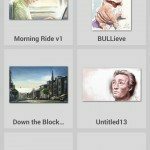 ArtRage for Android allows users to share to artist communities and social media sites, like PEN.UP, deviantArt, Facebook, Twitter, and Flickr, as well as send art by email or save to Dropbox. Ambient Design Ltd. is a New Zealand-based global software development and publishing firm, specializing in creative applications and user interfaces for artists of all ages and all levels of competency, including professionals, hobbyists and students. The principals have over 40 years’ experience in combining complex image processing algorithms with an easily accessible user experience. Ambient Design Ltd. was founded in 2000 by Andy Bearsley and Matt Fox-Wilson, formerly of MetaCreations, the developer of Painter, Bryce and Kai’s Power Tools. Ambient Design’s products are available in up to 14 languages and have been downloaded over 30 million times across various platforms. For more information, see www.artrage.com. ArtRage is also available for Mac and Windows and is compatible with Wacom styluses. 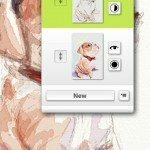 ArtRage 5 for Mac and Windows is priced at $79 USD from the ArtRage Store. ArtRage for iPad and ArtRage for iPhone are priced at $4.99 and $1.99 respectively from the Apple iTunes Store. For more information, see www.artrage.com, Facebook: www.facebook.com/artrage, or Twitter: @ArtRage https://twitter.com/ArtRage. Demo and promotional images using ArtRage for Android by Bo Paweena, credit to https://www.behance.net/bopaweena.